Polls have closed in Guinea in the first parliamentary election since a coup in 2008. The election commission suggested turnout had been high, with 40% of the electorate casting their ballots by midday. The run-up was marred by violence, ethnic and religious tension, electoral disputes and intense distrust. The opposition accused President Alpha Conde's party of trying to rig the elections. The vote will replace a transitional parliament that has run the nation since military rule ended in 2010. Poll dates were repeatedly scheduled and then postponed, largely due to opposition allegations that the government was trying to skew the vote. The polls were originally meant to take place within six months of Alpha Conde taking office in 2010. After a series of negotiations failed to end the impasse, the UN stepped in and helped set a date. Voting started at 08:00 GMT, with 1,700 candidates vying for 114 seats. Reports say some polling stations, which opened late due to bad weather, were allowed to stay open beyond the scheduled closing time of 18:00 GMT. Preliminary results are expected by Tuesday. Mr Conde said on Friday: "These elections will allow us to emerge from a chaotic five-year transition." Souleymane Doumbouya, a spokesman for Mr Conde's Rally of the Guinean People party, said: "We are already savouring our victory." Main opposition leader Cellou Dalein Diallo, said: "Alpha Conde invents a permanent conspiracy so that he can blame our party. These are old demons coming back, but they do not weaken us." 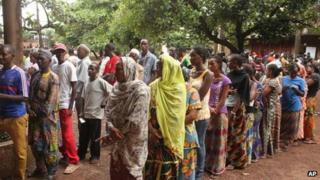 Voting at a polling station near his home in Conakry, Mr Diallo, accused the electoral commission of failing to resolve logistical problems, AP news agency reports. Head of the European Union's monitoring team, Christian Preda, was quoted as saying that a significant number of ballot stations did not have indelible ink and some were positioned too far from voters. The electoral commission has admitted errors but defended the overall conduct of the vote. Violence tarnished the run-up to polling, with opposition protesters shooting dead a trainee policeman earlier this week in clashes that left 70 people wounded. Religious and political leaders called for a calm election day and there were no reports of violence during voting. The military took control after President Lansana Conte died in 2008. Guinea has not had a legislative election since 2002.